After last year’s season finale, there’s been a serious time jump to link the crossover storylines between Fear and TWD. Through flashbacks, we learn that the Clark family has made their way to Texas and they’ve created a mini society living inside a baseball stadium. Slowly but surely, the viewer is introduced to Maggie Grace’s journalist, Althea, Jenna Elfman’s character with multiple names and Garret Dillahunt’s cowboy with two six-shooters, John Dorie, who is definitely the most interesting character on the show. While TWD based its main storyline through multiple years in a general location, Fear‘s characters are constantly on the move, and that’s not a totally bad thing. Revenge has taken a big toll on these characters and we see their storylines pieced together almost as if Quentin Tarantino was the showrunner (When can we make this happen?). Nick, who seemed to be the most-adaptable character to almost every scenario (and maybe the smartest recurring character, pending Old Man Salazar’s possible return), was sadly killed by a little girl in Episode 3, “Good Out Here.” This was a powerful, if not the second-best episode of the season, so far. I literally never had an idea this event would happen. 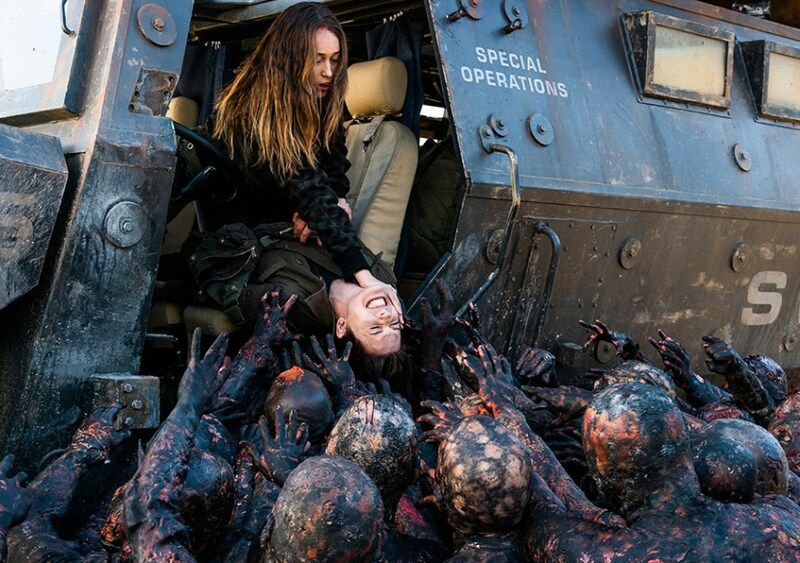 But on Talking Dead, Chris Hardwick revealed that actor Frank Dillane had asked to be killed off last year. So, it generally makes sense. What would have made much more sense in past seasons, was killing off Kim Dickens’ Madison Clark, the matriarch and previous leader of the family. She became somewhat of a sympathetic in her last moments of life, even though she’s become hardened, battle-tested and more violent than in seasons’ past. Hopefully, her self sacrifice won’t be wasted on the surviving characters. Everything (and everyone) is seemingly connected in this show, even if they don’t talk about it very much. Althea’s a journalist with many layers, whose sole purpose is to chronicle every characters’ life she runs into. Alicia’s quick temper leads to a near-fatal injury to John, whose straightforward Western gunslinger with PTSD is the best of the bunch. He’s the moral compass, but as we’ve seen in TWD, that usually means they’re not long for this undead world. Morgan has proven to be a calming, uniting force with the rest of the cast. I’ve got to say, I’m really enjoying the new characters more than the old ones, even though they were already established and this was their show. Season 4 has featured faded, washed-out color schemes to contrast the flashbacks to the flash-forwards. Really enjoying the new perspective of showrunners Ian Goldberg and Andrew Chambliss (but maybe it’s just the new camerawork, which is similar to shooting Western movies), as each episode has surprised me in its quality, but Episode 5, “Laura,” featuring the intimate encounter of John Dorie and Jenna Elfman’s mysterious woman of multiple names (Naomi, Laura, June) is the best one so far, possibly in the entire four-year run. Turning the previously considered “good guys” into antagonists was a nice twist, but the new characters have been a hazy shade of gray when trying to figure out which side their allegiances lie. The time jumps have been annoying at times, but they’ve been great for catching the viewer up to this point. Where will the second half of the season go? How about the family’s journey from California to Texas? Leading us to where this group of characters will get into next? That would lead to a great season-finale cliffhanger. I’ll admit, I had my doubts after Season 3, but I was definitely hopeful for the show’s hints of greatness. I can easily say this season is better than expected. Using flashbacks and flash-forwards to kill off main characters at the beginning of the season, while having them live on through the end of the year (and possibly beyond) is a unique approach to telling the primary story. The midseason finale, “No One’s Gone,” was heavy in terms of emotionally gut-wrenching elements, loosely wrapping up the storyline so far. Al’s camerawork is an effective storytelling tool in this episode, but how many micro videotapes will she have before she runs out (along with batteries)? Cup o’ noodles only lasts so far, too. Fear‘s next new episode returns on Sunday, August 12th.